The homeowner of this property in the community of Glen Oban, Arnold contacted Maryland Curbscape to help her create a safe and inviting backyard patio. The current owner became increasingly worried about the deteriorating state of her backyard patio. Being an elderly lady she was concerned that the small patio could present dangerous obstacles to her health. Maryland Curbscape met with the homeowner to discuss their plans for the remodel. Together they decided on an Exposed Pea Gravel / Exposed Aggregate Finish to create a continuous look and rule out any cracks and potential trip hazards. 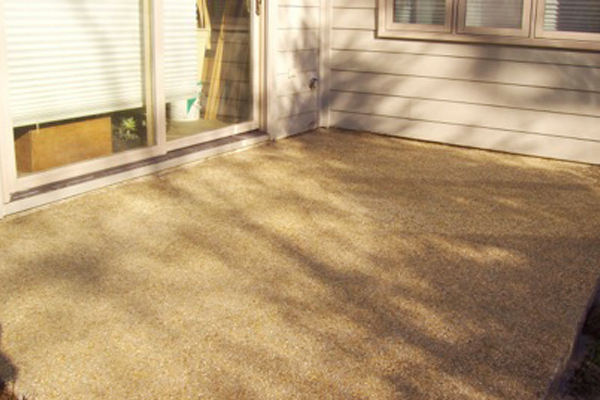 Exposed Aggregate was the perfect finish for this project as the surface is both slip-resistant and practical. The homeowner was thrilled with her new backyard patio. She now has a perfect size outdoor living area to add outdoor seating or a small garden. If you’re interested in a patio similar to this one in Glen Oban, Arnold, contact Maryland Curbscape today.